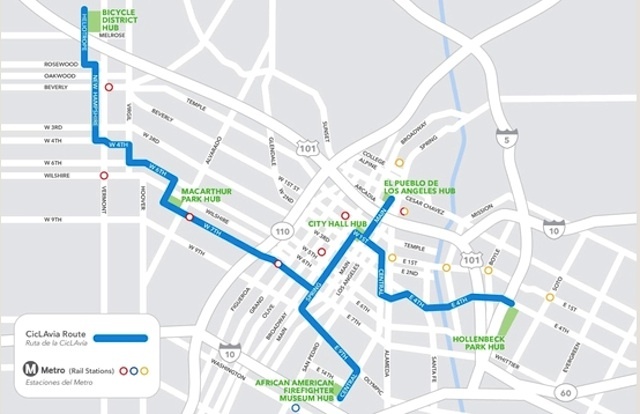 It includes the basic 10.10.10 route through East Hollywood, Koreatown, Westlake, Downtown L.A., Little Tokyo, and Boyle Heights - plus the new extensions that premiered last time: north to El Pueblo, and south to Fashion District and Central Avenue. The organization admits that while they were looking to expand the coverage for April, they also wanted to not bite off more than they could chew, so expect more expansion when the event happens again October 14. They&apos;re already talking about possibly expanding to areas like Mariachi Plaza in Boyle Heights, Chinatown, and extending further into South Los Angeles. For the uninitiated, CicLAvia is an event when a segment of L.A. city streets are closed for one day to motor vehicle traffic and open to pedestrians and cyclists. The events have been well-attended and well-received, and have been taking place in the spring and fall since its debut in October 2010.